regular mild steel materials handling components. Above and below: Images of previous transfer chute set up. The customer was experiencing a significant spillage problem around the transfer point area. Here the challenge was to contain the low mass salt particles effectively and stop them from bouncing off the belt. Due to salt causing hang up, fitting any type of skirting around the chute had not been successful previously. 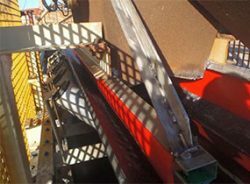 Not only was there wasted product, but the steel structure of the transfer point was quickly being affected by an increasing amount of corrosion caused by the salt. To maintain this area, it needed to be washed down frequently, creating additional labor costs. making it very lightweight and easy to install, requiring minimal labor. Also, because it is highly durable and resistant to corrosion, it will last longer once in place, requiring less replacement skirting in the future. This will achieve significant cost savings and reduce scheduled maintenance shutdowns. Installation drawing for Snap-Loc Dust Seal, showing weld point and retaining pin. Close-up image of conveyor chute and Snap-Loc after installation.